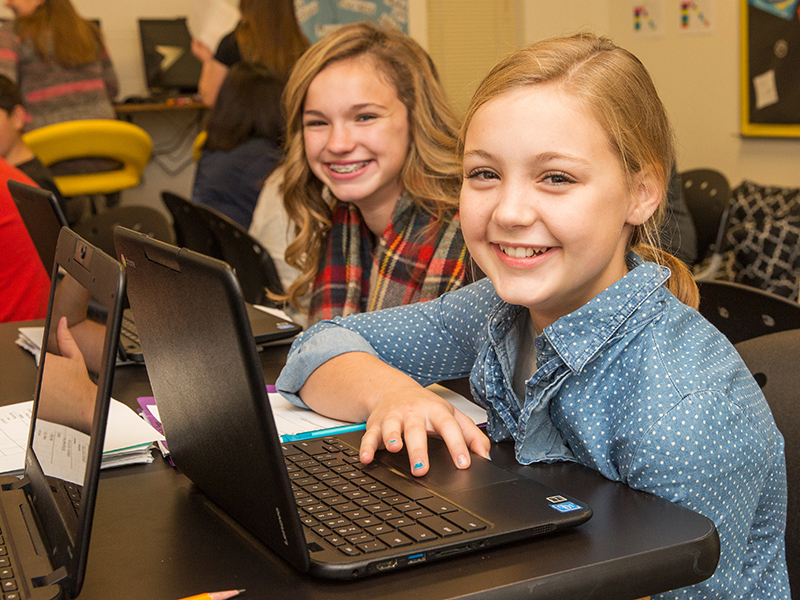 The NWEA MAP (MAP) tests are relatively new to Cisco Junior High School teachers, who began using them at the beginning of the transition to blended learning. Previously Cisco’s only annual benchmark test was the State of Texas Assessments of Academic Readiness, or STAAR test. With the adoption of MAP testing, Cisco started providing benchmark assessments three times per year. These benchmarks are meant to compliment the STAAR test, providing more frequent and relevant data on student progress. Teachers at Cisco use MAP data in multiple ways, all of which are designed to improve the student learning experience. Teachers review MAP data collectively during Data Days and individually throughout the year as needed. MAP tests help teachers get a sense for students’ academic strengths and weaknesses and informs how they should best modify instruction throughout the year to better match student needs. For example, before new units teachers review the relevant MAP data and adjust the time spent on topics based on how their class performed. Teachers also identify students with similar learning gaps and target them with small group instruction. If individual students need extra practice in certain areas, then their playlists will reflect it (such as working through specific content in Dreambox). Teachers also share MAP data with individual students, helping students reflect on their learning, track their growth, and set goals for themselves. Students at Cisco see MAP as more than “just another test.” Since MAP data is available quickly, students can review how they performed and determine why they may not have performed well in certain areas. They can also set goals for themselves for future MAP tests, since they occur within a meaningful time period (months instead of years). Students can better connect their day-to-day learning with MAP data and goal setting, seeing how their hard work is paying off with growth in MAP scores after each subsequent test. Students who score well on MAP tests can also advance beyond, or “test out” of certain playlist options related to topics they already mastered. Takes MAP test three times each year. Reviews MAP data, reflecting on their results and the areas where they need to focus. Sets growth goals for the following MAP test. Skips over content instruction for areas where they have already demonstrated mastery via the MAP test. Reviews class MAP data and modifies instructional focuses based on need. Reviews individual MAP data and provides targeted instruction to small groups with similar knowledge gaps. Modifies individual playlists for students, providing extra review and support for areas of need, and minimizing exposure to content already mastered. Provides an online assessment platform to attain benchmark data. Provides easy to read and understandable data for individual students and classes. Provides online content that can help address learning gaps identified with MAP data.